Android M is Finally available for some of the Nexus devices and they are Nexus 5, Nexus 6 And Nexus 9. If you are the owner of any of these devices than you can try the Android M developer preview on your device. The Android M Comes with lots of new features and more stability. In simple words, we can say that the next version is more into performance and security. 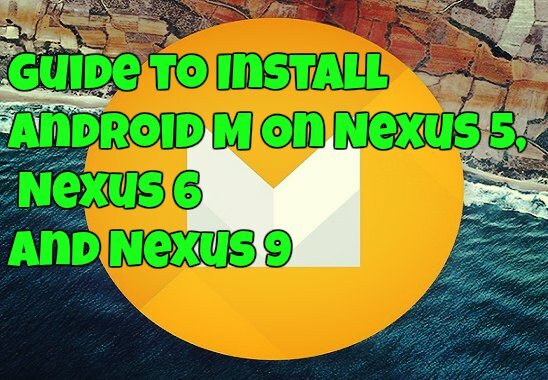 If you want to test the new Android M on your Nexus, here is the complete guide which you can follow on your Phone and Windows PC and install the same. The process is very simple and all you need Android M image and ADB file to run some commands on your desktop. Before following this guide do take the full backup of your Nexus and this guide is only for the Nexus 5, Nexus 6 And Nexus 9, don’t try this on any of other Nexus devices. Step 1. Download Android M Images from the below mention link and extract the folder on your desktop. Step 2. Install the ADB drivers on your desktop. Step 3. Now boot your Nexus device in bootloader mode and connect it to the PC. Step 5. Now the Flashing Process will start on your device and this will take some time. Step 6. Once the flashing process is completed your device will reboot automatically. Now enjoy Android M on your Nexus! !